Passing the baton from one generation to the next proved to be even more difficult. 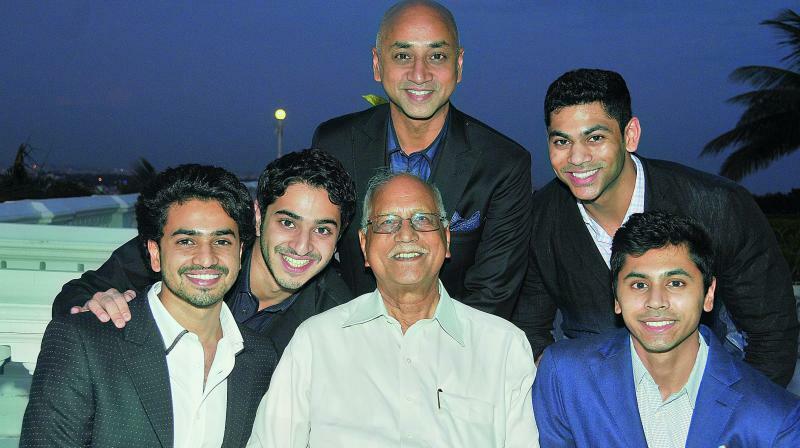 Ramachandra and Jayadev Galla pose with the latter’s sons (on the left) Ashok and Siddharth and nephews (on the right) Harshavardhana Gourineni, MD, Mangal Industries Limited and Vikramadithya Gourineni, MD, Amara Raja Power Systems Limited and Amara Raja Electronics Limited. Jayadev Galla, politician and the Vice-Chairman and Managing Director of Amara Raja Batteries, talks about the many personal and professional challenges he faced in his entrepreneurial journey. The early ’80s in India weren’t an easy time to do business. As Ramachandra N. Galla, Founder and Chairman of Amara Raja Group discovered when he started off in 1985 in his home district of Chittoor in Andhra Pradesh. “The dynamics of the economy were changing rapidly. The government at that time was supporting non-resident Indians for entrepreneurship to take the country’s industrial growth forward. However, when I finally returned from the US, the odds were heavily stacked against entrepreneurs. Issues like lack of infrastructure, logistics, and non-availability of skilled labour made it an uphill task,” says Ramachandra. Passing the baton from one generation to the next proved to be even more difficult. His son, Jayadev (Jay) Galla’s (Vice-Chairman and Managing Director, Amara Raja Batteries) entrepreneurial journey began in America. “I felt disconnected from the people and culture and realised the need to live in India. I felt that I could use my experience and knowledge to make a difference in India,” says Jayadev. While originally, the business focused only on batteries used by the telecom, power and oil-and-gas sectors, Jayadev wanted to expand into vehicles which were dominated then by Exide industries. He took over the business from Galla senior in 2003, by when Amara Raja had already come a long way. “But the overall economy when I entered the business was weak. The profits at Amara Raja Batteries had tanked to $300,000 from $1.6 million the previous year. We were established but also had to go to the next level. We planned well, sensed the glitches and moved ahead. While ensuring that the business grew and met all its targets, I also had the responsibility of ensuring that my father’s vision for the company remained our guiding principle,” says Jayadev, admitting that the challenges faced by him and his father were different. Despite the apprehensions, Jayadev was confident that they’d be able to pull themselves out of the crisis. “We worked hard and started to innovate and from that low point on, our revenues grew 18-fold. We rose like a phoenix,” he says proudly. The growth wasn’t without conflict between the two generations. “I pushed for auto batteries because being only in industrial mode made the company vulnerable. But my father resisted, because the sector had an entrenched player like Exide on one end and unorganised players churning out cheap knockoffs on the other. Finally, after three years of constant arguments with my father, he relented and I got the opportunity to introduce my ideas,” says Jayadev. He reveals that at one point, he told his father, “This town isn’t big enough for the two of us and one has to quit.” Ramachandra took a backseat and Jayadev took over the full reins. Just like his business, the decision to enter politics too was taken at a young age. Jayadev’s grandfather was a freedom fighter while his mother was in politics for 25 years. “The biggest lessons in life are those you learn from people around you, that you implement to benefit others. Be it business or politics, one can’t move ahead alone. When I moved back to India, I wanted to enter politics too. But like all other things, one needs to have the right skills. It’s only after you have lived as a citizen, contributed and achieved something for the people of this country, that you can enter politics. That’s why it took me 22 years to take the first step into politics,” says Jayadev, a TDP LS member.